The earth absorbs solar energy from the sun allowing the ground to remain at a nearly constant temperature, between 50 to 70 degrees Fahrenheit depending on geographic location. A DX geothermal system utilizes these constant temperatures to exchange heat between your home and the earth as needed for heating and cooling. By using the direct exchange method, you’re able to reduce the number of heat transfers, which directly increases your home’s heat output. In a traditional water geothermal design there is a total of three heat transfers, while in a DX geothermal system there are only two. By reducing the number of heat transfers, a DX geothermal maintains extra heat that would normally be wasted. 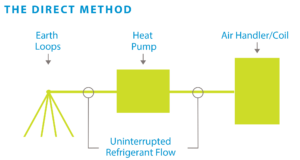 Eliminating waste results in a higher heat output. As a result you could experience lower operating cost, better comfort, and bigger savings. 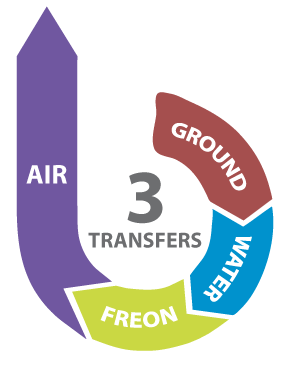 During the winter, the heat is transferred from the earth to the ground loop, which is filled with refrigerant. 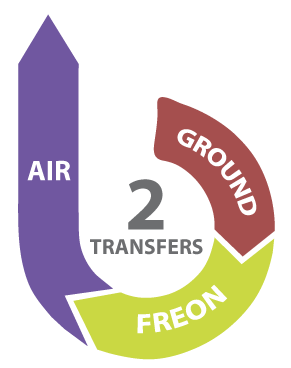 The heated refrigerant is then returned to the home through an enclosed ground loop. The inside unit then extracts the heat from the refrigerant and moves the warm air through your ductwork. This process is reversed during the summer to remove heat from your home. In the summer months when the cycle reverses, the system removes heat from your home, therefore cooling your house down. It then moves the heat removed from inside your home out and releases the heat into the cooler earth via the buried ground loop system. This heat exchange process is not only natural, it is also an extremely efficient, effective, and reliable way to create a comfortable climate in your home. Waterless™ DX Geothermal has innovated an old industry. Click Here to see what makes a Waterless™ DX Geothermal so different from a standard water geothermal system. Discover more about how Waterless™ DX Geothermal Works and how it can benefit you!